We'll send your team a reminder to share what they've worked on (they can share as often as they like). Using artificial intelligence, updates are categorized by emotion and automatically tagged with relevant hashtags. Your team's notes are presented in an easy-to-read format (see below) designed to make it fast to see who's doing what. In the near future, we'll be adding additional ways to gauge the health and engagement of your team. The overall focus is building the tools for your team(s) to be successful. 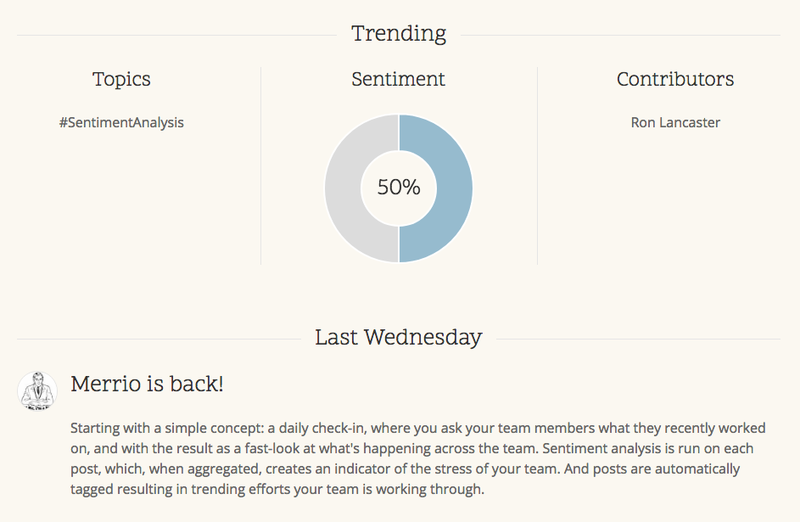 Highlights trending topics, contributors, and the team's sentiment based on their updates..